I have a pet peeve: stick people. So I thought... well... might as well start at the beginning. I came across a people drawing lesson in "Talking, Drawing,Writing" by Martha Horn and Mary Ellen Giacobbe, a book about art and writing that starts with using ovals for every body part. My first idea was to do this lesson with all the students and then have the Kindergartners draw clothes on them, the first graders fill the ovals with patterns, and the second graders do elaborate warm/cool compositions by filling the people ovals with warm or cool parallel lines and then doing a background in the opposite color. Heh. I was a little overambitious on the second grade idea. We were lucky to get the person filled with lines, although a few students did manage to go on to a second bubble person, as they came to be known. This lesson, for all three grade levels, started with a "loosening up" exercise with a large sheet of white paper on which they practiced drawing dots, circles, ovals of different sizes and shapes, and assorted lines. Then Kindergartners had a read aloud - "From Head to Toe" by Eric Carle (which included much wiggling, clapping, stomping, and kicking) - and everyone learned how to use ovals of different sizes, shapes, and lengths for all the main body parts. 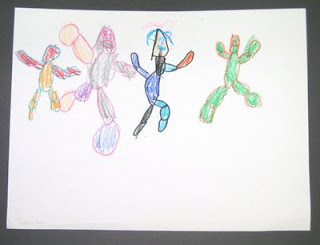 Kindergartners were asked to color their bubble people any way they wanted, and as they finished, to draw more on their practice paper. First graders filled theirs with dots and lines, using two primary colors, and those who had time were able to mount them on the third primary color. One creative first grader decided to mount his standing on one hand, and was careful to remind me that it goes "this way." 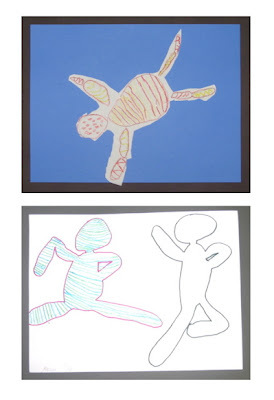 :-) Second graders drew a contour line around their bubble person to define the shape. They then filled the complete shape with warm or cool colored parallel lines. If they finished one, they were asked to draw another on the same paper and to fill it with lines using the same colors. Everyone did a great job! During sharing we looked at how different they all were, and students were able to talk about what was hard to do, what they liked about their bubble people.